This has been one of those awkward months that always ends with me feeling I could have done more, but didn’t. On the other hand, sales of The Trafalgar Gambit have been very good and I’m having a new cover produced for Ark Royal, so I suppose I shouldn’t complain too loudly. Next month is definitely going to be poorly organised. We have a plan to travel to Australia for 10 days in the middle of the month, then a visit to family at the end of the month, which is irritating for my writing schedule. (My wife says I should be more flexible, but I’m not good at being flexible.) I may end up writing the next book, then taking a break during the second holiday, although I dislike taking breaks. I sometimes lose my train of thought and have to take time to re-gather it. That said, I’m currently approaching the denouncement of The School of Hard Knocks. The next book will either be The Thin Blue Line (The Empire’s Corps 9) or Hard Lessons (A Learning Experience 2). What would you like to see? I also have to write a short story for the TEC universe, featuring Blake Coleman going to school and telling the children what it’s like to be a Marine. This would be more of a ludicrous story than anything realistic … yes, I know there’s nothing realistic about space travel just yet, but I can dream. I’m also drawing up the plots for The Shadow of Cinetetcus (Barbarians II), Bookworm III and the planned second trilogy in the Ark Royal universe. I’m having problems; basically, I want to focus on the more quieter jobs done by the Royal Navy, as the First Interstellar War has come to an end, but the story also needs to be exciting in some way. Annoyingly, I have more of book II sketched out, but it needs careful editing or someone will claim I’m ripping off an idea from a more famous author. Sigh. Generally, my plan is to focus on a smaller ship, perhaps a cruiser put into hasty construction to make up the fleet lists after the losses of the war. HMS Warspite, perhaps. Maybe a completely inexperienced captain instead of a drunkard … no, I’ve done that. Maybe someone in disgrace for some reason? No, that wouldn’t fit. This ship won’t be a legacy from another era. What about a designer rather than an experienced captain? He designed the ship, but didn’t come up through the standard ranks like a normal officer? What would you prefer? I’ve also been doing the editing for Necropolis (The Royal Sorceress III). Whoever said that editors weren’t doing so much these days obviously never met the editor Elsewhen Press employed to edit my work. (Or the Twilight Times Press editors, for that matter.) After the usual routine of the seven stages of grief – “OH GOD! WHY? WHY? WHY?” – I knuckled down and started to do the editing. I just completed the second set last night, so hopefully there won’t be many more. As always, the cover art looks like a painting, which is in keeping with the rest of the series. I’ll put a copy on my site once I get the go-ahead. In other news, I received a mention on Instapundit! I’ve been asked, more than once, to comment on the dispute between Hachette and Amazon – and, to be honest, I don’t think I know enough to say. There’s so much mud being thrown around that it’s hard to be sure of what is actually going on. What I will say is this; traditional publishers generally acted as the gatekeepers between the reader and bad literature. They provided services – editing, cover design, promotion, etc – that the writer needed to make his book better. On the other hand, the writer had to actually produce a readable book before the editor made that investment. The advent of the internet and self-publishing allowed writers to bypass the publishers and put their work online; Amazon, to its credit, has done a marvellous job of setting up a system that allows writers to sell, without the barriers used by traditional publishers. But Amazon is a product of the digital age and most publishers are not. Notably, newer publishers (small presses) are quite keen on ebooks, as is Baen Books. The good part of this is that anyone can write a book. The bad part of this is that anyone can write a book. To borrow a line from Eric Flint, writing is a skill that has to be learnt; the average writer needs around a million words to get something remotely readable. (Put in context, the entire Ark Royal series is around 360’000 words.) However, writers are very attached to their writing and few have the detachment to consider it objectively. They are thus outraged when traditional publishers dare to reject their books. I know I moped for days when my first book was rejected, even though (in hindsight) I shudder to think what the reviewers would have said if I’d put it online. What this tends to mean is that writers, utterly confident in their own abilities, WILL self-publish poorly-written books(*), sell only a handful and get savaged by reviewers … and this great outpouring of dross will bury the more decent self-published writers. But it hasn’t buried quite a few self-published writers, like Hugh Howey. And me. The major change, as I see it, is that the gatekeeping role has moved from publishers to readers. Someone can go on Amazon (or to my site) read the free samples and then decide if he/she wants to read the book. There is no longer an ‘we decide what you read’ attitude from the publishers (or at least not a particularly effective one), but instead the task of sorting through the dross falls to readers. The reviews are, as a general rule, written by ordinary people, rather than the NYT or other famous authors. I tend to find them more accurate than highly-paid editors/reviewers struggling to find social meaning in a thriller novel. The internet also makes it easier for the writer to interact with his fans, edit his books and compensate for mistakes. (I’ve only ever had one reply from an author through the regular mail, which thrilled me for days.) I don’t know if this is true for any other publishing company (with the exception of Baen). What I think will happen is this. The writers who do well, who actually reach the point of being competent writers, will get the notice they deserve. It will, however, take time and effort. As always, there are no shortcuts worth taking in the long run. My advice to traditional publishers would be simple. There are no barriers to you setting up an ebook selling system like Amazon Kindle. You already have the advantages of cover design, editing, and the author’s name. So … give a fair share of the profits to the author (Amazon’s 70% is very generous) and sell ebooks directly. Listen to customer opinion and sell without DRM (Baen is VERY good with this), because there’s no DRM that is both unbeatable and actually creates usable books. And what is the incentive to change? Think about it. Being published by a traditional publisher is a huge boost to an author’s prestige. Someone like Kim Stanley Robinson has huge name-recognition right now. Why can’t they take that, which publishers have done for them, self-publish on Kindle and go home laughing while counting their cash? The monopoly on publishing is broken. It cannot be repaired, nor should it be. Instead of the authors courting the publishers, it is inching towards the other way round. And, really, publishing Hilary Clinton’s latest set of bland excuses as she edges towards a presidential run isn’t going to suffice in the long run. Going back to Malaysia was a complicated process (ok, it was one I made complicated because I wanted to spend time in London before boarding the plane) but I spent most of it reading various books. I planned to write reviews of all of them, but I simply don’t have time. Instead, I thought I’d write a short overview <grin>. A War Like No Other is focused on the war between Athens and Sparta. Unlike other books, it is an analysis rather than a narrative history, but a pretty good one. I wouldn’t recommend it as the introduction to that era of history, but it does serve to broaden one’s knowledge of the war. Bonnie Prince Charlie is a biography of (you guessed it) Charles Edward Stuart, who attempted to overthrow the Hanoverian Monarchy in 1745. Sadly for someone brought up on stories of the Prince in the Heather, this book makes it clear that Charles Stuart was little more than an immature manchild, a perpetually-rebellious individual struggling for power and authority to the point where he even alienated the hard-boiled French Court. His resentment of anyone who attempted to ‘give him laws’ pervaded his dealings with anyone, leaving him unsatisfied unless he had complete authority. Which isn’t the feeling of 1745: A Military History. This author, focusing purely on the military aspects of the Rising, concludes that Charles simply didn’t have a chance. The expected support from England simply hadn’t materialised, King George had several more armies at his disposal and a vast preponderance of firepower (as well as maintaining control of several vital locations in Scotland). All the Rising really achieved was to spur the government to disarm the Highland Clans, ensuring that there would never be another Rising. The Fall of the Roman Empire (Michael Grant) isn’t a narrative history, although it does provide an overview of the years past Marcus Aurelius to Romulus Augustus, the last formally-recognised Roman Emperor. Instead, it too concentrates on analysis, noting that the Roman Empire had so many structural problems that defeat and collapse was almost inevitable. The important point, and why this book is well worth a read, is that many of the flaws in Roman society are mirrored in our own society. Pirate King: Coxinga and the Fall of the Ming Dynasty is an entry into an area of history I knew little about, beforehand. Coxinga was pretty much the last defender of the Ming Emperor in China, a lord who (at his height) commanded a large fleet, ravaged the coastline and even waged war on the Dutch. There is plenty of room for alternate history speculation in his story; if he’d captured the Philippines, as he had been planning to do in the aftermath of his defeat in China, the world would be a very different place. Fires of October is a look at the US planning for an invasion of Cuba, during the Cuban Missile Crisis. The author makes the point that the invasion might have been a US victory, but it certainly would not have been a walkover, as the Cubans were dug in, armed to the teeth and prepared (and experienced) to fight an insurgency after a formal US victory. Even without nukes, the war would have been bloody – and it was quite possible that nukes would be used, probably the one targeted on Gutanamo Bay. The US intelligence system simply didn’t realise just how many Russians were on the island or how many nukes they had. This is not a counterfactual history – there’s an outline of what the war might have looked like in What If America – but a sober look at the war plans of all three powers involved in the crisis. On similar lines, I read Operation Unthinkable: The Third World War: British Plans to Attack the Soviet Empire 1945. This book, despite its bold title, is more of a loose history of emergency planning as WW2 moved to a close, without the richness of detail that Fires of October showed. Interesting, but very small beer. Finally, I found Leviathan: The Rise of Britain as a World Power. This is, in many ways, a very loose overview of the factors that helped Britain rise to power, as well as an introduction to vast sweeps of history. Interesting, it is; tight and focused, it is not. It’s a good overview, but those wanting more details will have to look elsewhere. We’re back in Malaysia – and having terrible problems with the internet. Sigh. If you’ve sent me an email and don’t get a reply by Monday, please resend. I think I’ve lost quite a few emails over the last few weeks. Longer post soon – I just want to make a solid start on The School of Hard Knocks before I post anything else. The important piece of news first – The Trafalgar Gambit is now available from Amazon, please review it if you liked it <grin>. I’ve also spent the day inserting changes and spelling corrections into several other books, including the Outside Context Problem series and several others. Feel free to re-download them for the most up-to-date edition. What I would like, if possible, is feedback on the annotations. I’ve uploaded annotations for both Schooled in Magic and Lessons in Etiquette, but I don’t know how they’re being received. If you like them, or you want to suggest changes and improvements for SIM3, please go to the discussion forum and let me know. I’m also bringing out audio versions of both The Empire’s Corps series and Ark Royal, which should be making their debut in July. Watch this blog for more details. I’m working on outlining ideas for a second series based in the universe of Ark Royal, probably focused on a smaller ship. Comments and suggestions would be very welcome. I’m also messing around with a plan for both a SIM spin-off (a stand-alone book that will tie into the series later) and a fantasy trilogy loosely based on the Sacred Wars in Greece. Both of them will require much more research, but they will come eventually. Anyway, I’m off to bed. The Trafalgar Gambit (Ark Royal III)–Available Now! Read the thrilling conclusion now! Humanity is losing the war. The once-mighty space navies have been crippled, officers and crew have been stretched to the limit and Earth herself has come under heavy attack. The end cannot be long delayed. For Admiral Smith and the crew of HMS Ark Royal, the stakes have never been so high. The one hope is to make contact with alien factions that might oppose the war. 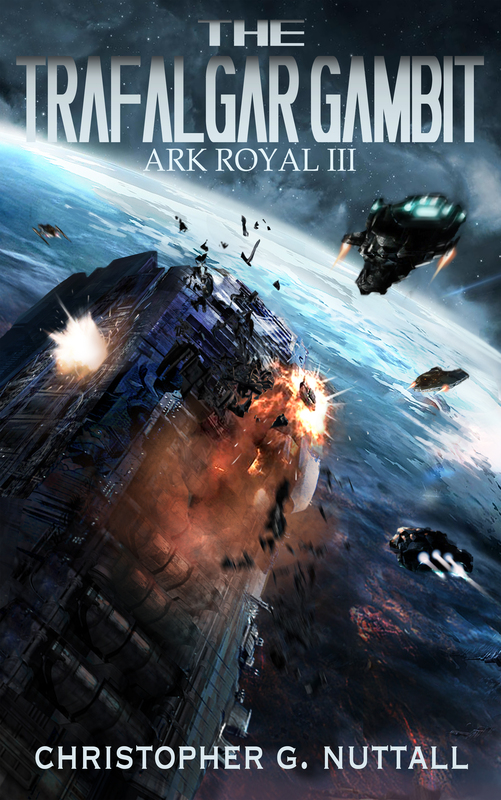 But, as Ark Royal sets off on a desperate diplomatic mission, it rapidly becomes clear that there are both human and alien factions that wish to fight the war to the bitter end – and that her previous missions have sown the seeds of success … or total failure. Good news first – The Trafalgar Gambit is currently working its way through Amazon and should be available in 24hrs or thereabouts. I’ll post here and the mailing list when it’s up and all the links are in place. Bad news – I’m taking a holiday and leaving the computer alone (well, I’ll try). I hope to start The School of Hard Knocks on the 17th, depending. By then, I will be back in Malaysia.